I’ve been posting healthy Freezer Meals the past month, so if you’ve been enjoying those ideas and want more, here is a roundup of the posts from this series, as well as directions for freezing some of my other favorite recipes. Freezer meals are such a great way to ensure your healthy-eating goals stay on track during busy weeks. I’m totally hooked on this large batch/freezer method, and I’m sure you will be, too! I’ve had so much fun brainstorming healthy freezer meals for this series. In the past, I haven’t been great at freezing meals. I’ve been missing out! This series has really motivated me to have healthy, homemade meals ready to go, which means when the week gets busy, a healthy, hot meal is still served. I had planned on doing more meals in this series, and I still will. I am aiming to post 1 freezer friendly meal a month, and I will add those recipes to this post throughout the year. Looking through my archives, there are other recipes from the past that would also freeze well, so I am going to highlight those with instructions here! 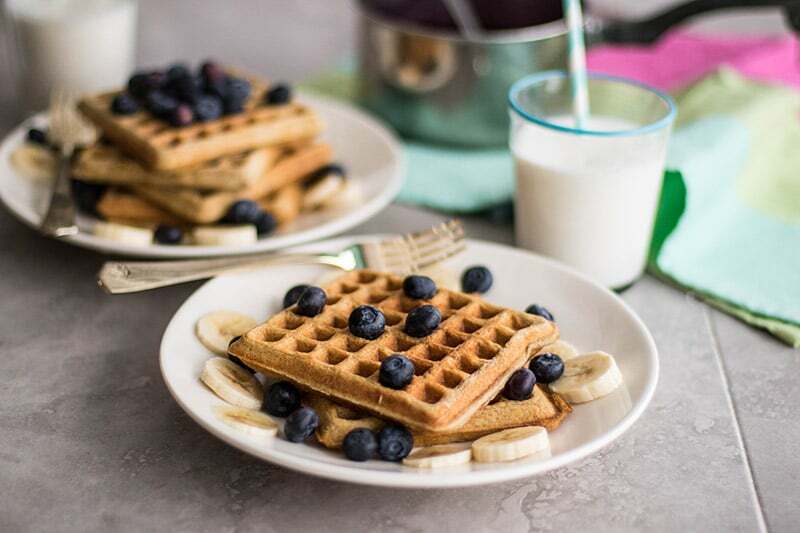 These waffles freeze so well, and make such convenient breakfasts. I’ve frozen waffles in the past, and had them be too dry when reheated, but that’s certainly not the case here. When making these waffles, only cook them until really lightly brown. When you reheat them in the toaster, they will brown more. Now when making these, I make a double batch, and after we’ve had breakfast, I freeze the rest. If you’d like, do the same with the blueberry sauce. Most often when I reheat them for breakfast, I just spread them with nut butter and add some fresh fruit on top. These are the ultimate freezer-friendly meal. They are a great snack, but more often, I grab one for a quick breakfast with a cup of coffee. No reheating or dressing up needed! I also have a Oatmeal Raisin Cookie Protein Bar, if that flavor is more your style. 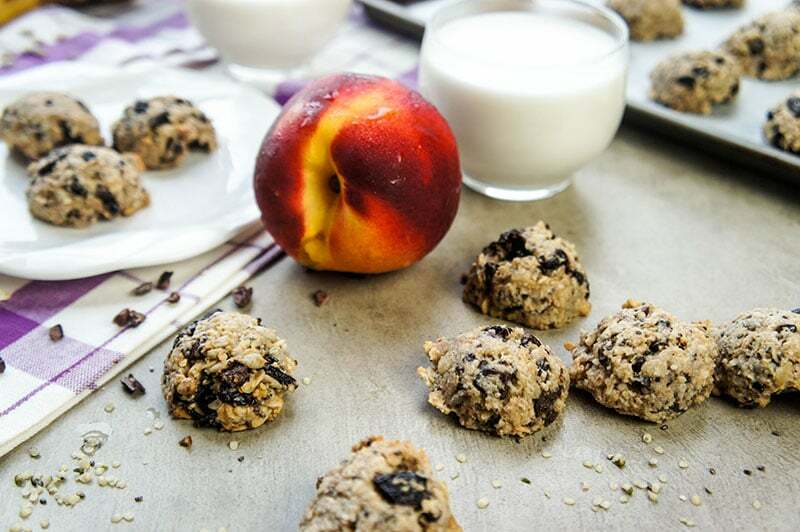 These are a great snack or breakfast option. 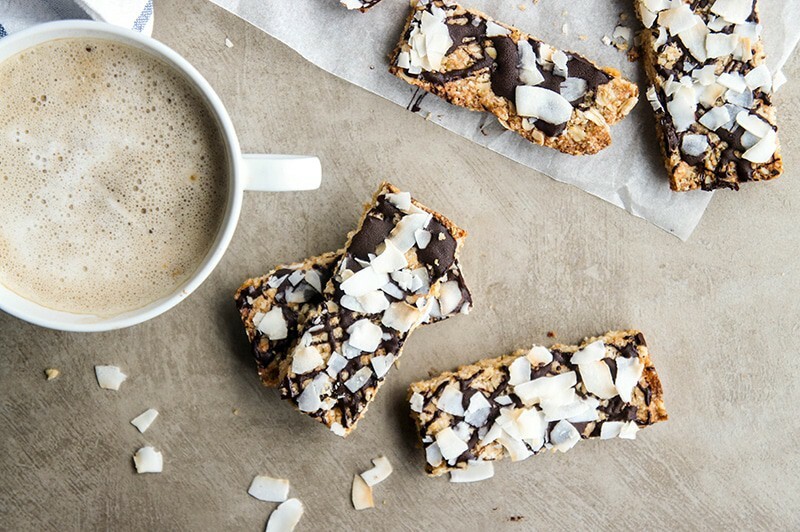 They are entirely sugar free– sweetened only with fruit, which I love in a breakfast (I guess the dark chocolate has a little sugar in it!). These are customizable– if you can’t find unsweetened dried cherries, use raisins or a less-sugar added cranberry. If you didn’t catch these the first time around, they are a must this summer! If you’re looking to feed your family more meatless meals, these are a real crowd pleaser. 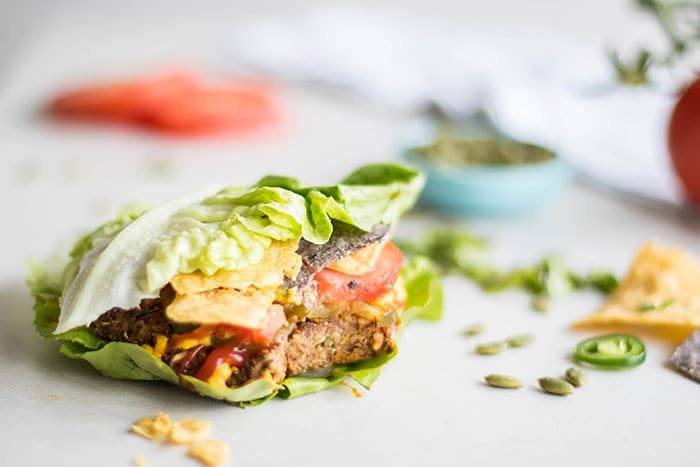 Serve these burgers on buns or in lettuce wraps with some chopped lettuce, pickles, and tomatoes, or if you have a little more time, caramelize some onions or saute some mushrooms for a more gourmet touch. I’ve been keeping these in the freezer, both in large patties and in smaller ones, and pulling them out for lunch for Xander and I. It really motivates me to stop and eat real food when I’m busy. 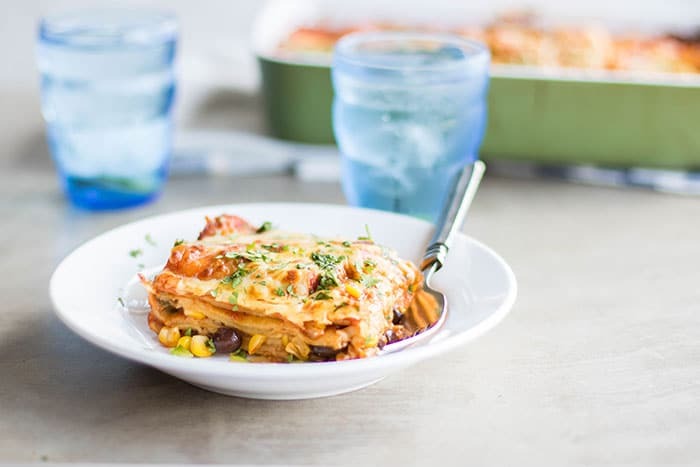 These prove that convenient freezer meals can go much further than casseroles! This is one of the easiest and most versatile dishes you can make and freeze. The recipe makes enough for 3 meals for a family of 4. Since we have a little eater in our house, that means 3 dinners with leftovers for lunch. 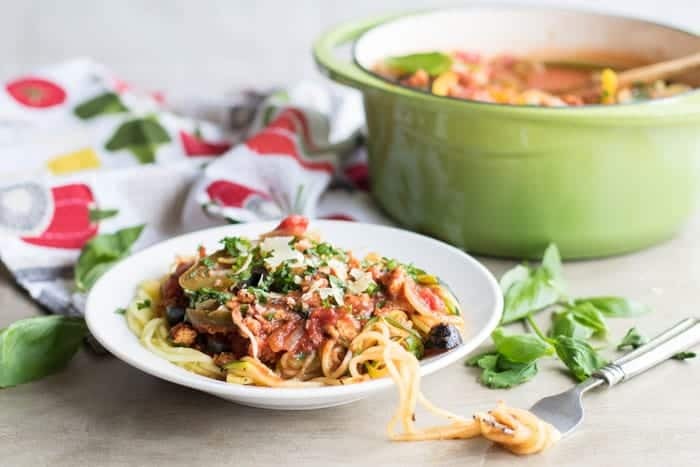 We love serving hearty sauces like this, packed with veggies and protein, over zoodles or butternut squash noodles. It’s also good over pasta, rice or quinoa, and when I’m busy, sometimes I even just heat a cup of this up, sprinkle on some parmesan, and eat it like a chili. I’ve wanted to make an enchilada casserole for the longest time, and I knew it would be perfect for this series. The recipe makes 3 8×8 pans, or 1 9×13 + an 8×8 pan. It takes about 30 minutes to put together all 3 if you use store bought enchilada sauce, or if you already have my Homemade Enchilada Sauce prepared (which I make in a large batch and freeze for easy use later). There are some tips in this recipe for making it even faster and easier to put together. It’s such a versatile recipe– you could also add ground beef, or shredded rotisserie chicken, to change it up. The next time I make these, I will make each of the 3 casseroles a little different by adding different veggies or chicken to them. 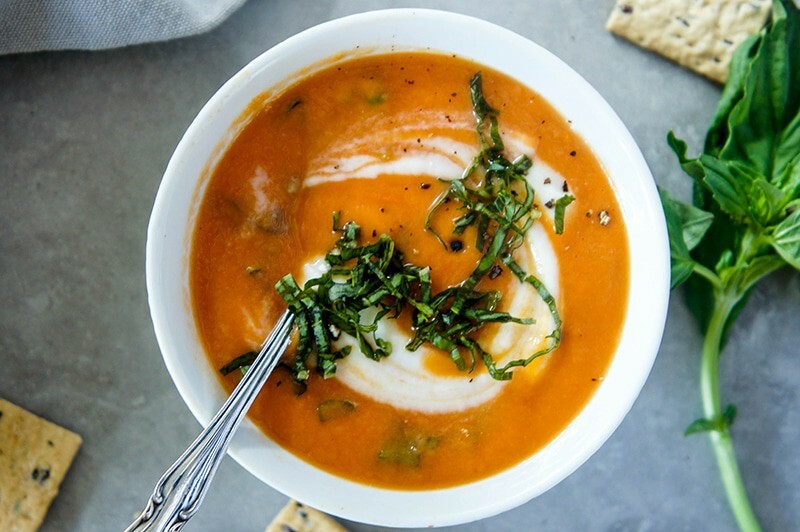 We love this soup SO much. It’s so creamy, you’d never guess it’s totally dairy free (I love to add a sprinkle of parmesan on top!). I am planning on doubling this recipe next week and freezing several smaller containers of it for lunches or dinners. Because of the cashews, it makes a filling lunch on all it’s own, but it’s even better if served with a small salad or a grilled cheese! I’ve never had this frozen for more than a month, but I am sure it would be fine up to 3 months, if sealed right. You can do this in tight sealing plastic containers, or just in freezer ziplock bags. 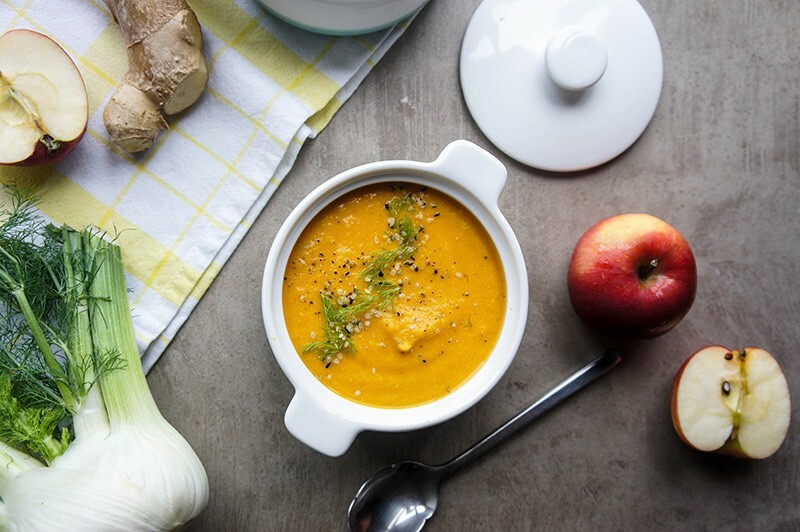 Here’s another flavor packed soup that can be frozen and still be 100% delicious after reheated. I also recommend doubling this recipe if you plan on freezing it. It’s another one that makes a perfect lunch on it’s own. Serve with crackers, bread, a small salad, or half a sandwich, for a larger meal. We love these chicken fingers, and especially the dipping sauce! When I freeze these, I bake them for 3-4 minutes less, so they are just lightly browned, but still cooked through. To reheat, allow to thaw for 30 minutes, then bake at 425 degrees F for 10-15 minutes, until hot through and crispy on the outside again. The sauce freezes as well! Just gently reheat and mix well. You might need to add a little water until the consistency is right again. I also have a recipe for healthy Oven-Baked Chicken Nuggets, if you want to try something without pistachios in it. I will be linking future freezer friendly recipes to this post, so be sure to Pin it, or Share it on Facebook, so you can easily access it! Great collection. they all look so good! What a great collection of recipes! I love making tons of food in advance and freezing it. Saves a lot of time! 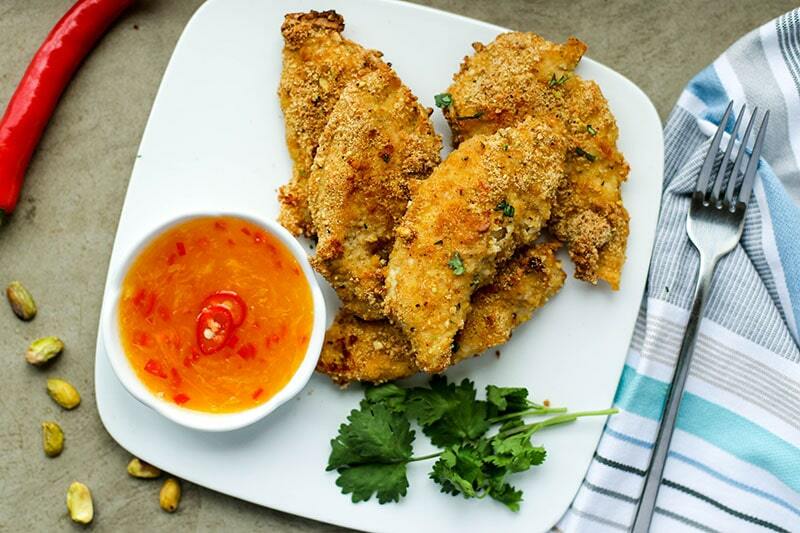 There are some really tasty looking recipes there, and I love the look of the PISTACHIO CRUSTED CHICKEN WITH ORANGE CHILI DIPPING SAUCE! Fab post! Thanks Karen-- those chicken fingers are so good! I totally agree, the key to eating healthy is being prepared. What a great way to do that! All these recipes look so tasty! There is so much great choice here. Having a freezer stocked with healthy pre made meals is key for us staying on track. It really is Dannii-- I've never really done it before, but was responding to a question a few readers had asked. I have really enjoyed having all those things in my freezer the past 2 months!